The animal kingdom is exceptionally beautiful. We see something new every day from unexpected friendships to adorable rescues and reunions. Animals, like humans, can perform incredible acts of kindness towards other species – not just their own. Our story takes place in Botswana, Africa where a lion pride attacked a group of baboons. The whole event was caught by wildlife photographers Evan Schiller and Lisa Holzwarth. The sight left them baffled and marveled all at once. The baboons had been frightened by something, scampering up trees. They shouted an alarm, making a big scene – it became clear when two lionesses came out of the tall grass. The females chased them up into the trees, joined by two more lionesses soon. Within seconds, the lioness realized there was a baby baboon nearby. Instead of gobbling up the baby, the lioness started playing with the baby baboon. The baby tried to escape back up the tree, yet failed. “The baby was showing signs of physical harm and fatigue from the whole ordeal. The lioness picked the baby up in her mouth – it was in agony watching the baby’s ordeal – and I kept on turning off the video option on my camera because it was hard to record.” Evan said of the event. Two lions distracted the lioness. She met their advances with aggression. Who is to say she was protecting the baby baboon or just fighting off their mating advances? However, things got interesting; waiting in a nearby tree was a male baboon. He was intent on saving the baby. The male lions causing a ruckus gave him a small window of opportunity. 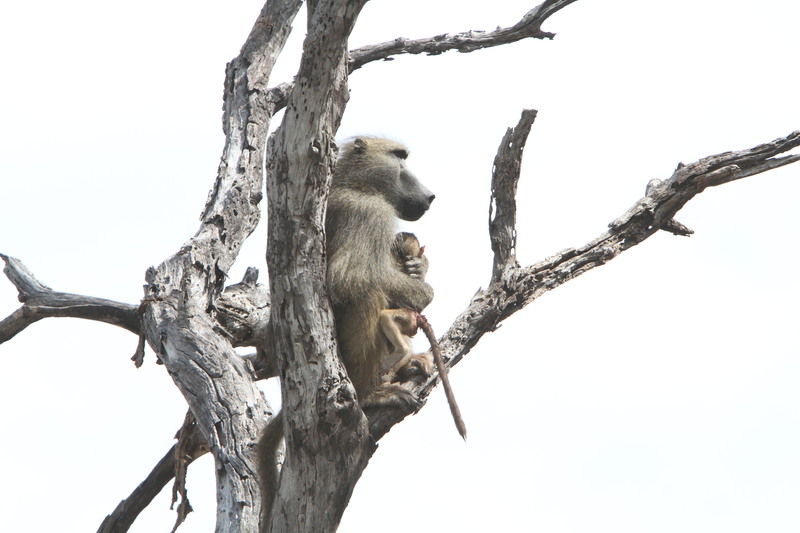 The baboon descended from the tree, grabbed his baby and made it safely back up to the top. Unfortunately, the baby also suffered from the heat. The father waited patiently before getting the baby into the shade of flowers and a neighboring tree. So, what happened to the baby? In the end, he survived with the help of his troop. Evan and Lisa could see he was obviously safe in the arms of his father. Of course, Lisa and Evan were truly lucky to witness the remarkable events of the animal kingdom!